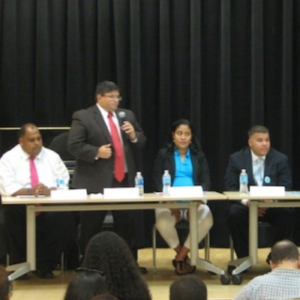 Scores of Bronx residents turned out at the Bronx Library on July 22, 2013 for NYLCVEF’s District 15 City Council Forum. The forum was hosted by the New York League of Conservation Voters Education Fund, alongside Bronx Health Reach and the Mary Mitchell Family and Youth Center. It was moderated by the Education Fund’s Marcia Bystryn, as well as Kelly Moltzen from Bronx Health Reach and Lili Hurley from the Mary Mitchell Center.